‘Tis the season of festivities, holidays and summer. With so many festive events and New Year planning, it can be difficult to keep up-to-date with everything that is happening in the media and your industry. That is why we’ve created the December Media Events Calendar. 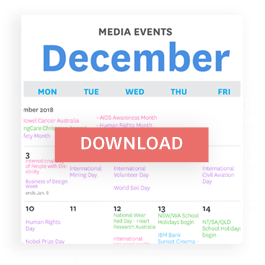 As a part of the Australian Associated Press, we have leveraged our relationship with the newsroom to show you what upcoming events journalists have on their coverage agenda. Keep up-to-date with key media events, notable upcoming news stories and what’s trending for the month of December. From Hanukkah and Christmas to raising awareness for bowel cancer and AIDS, to fighting and celebrating global human rights.